Well what do you know, the week has ended and we're all back to our normal lives. There are a few things worth mentioning from day four of the meeting, apart from the usual chatting with interesting people and the scrumptious dinner at the Palace of the Parliament. 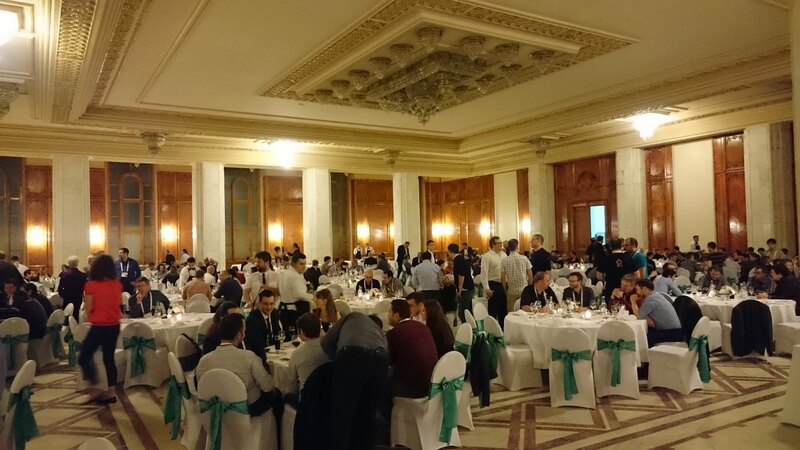 We've been very busy here at RIPE71, as you might have read in my two previous posts - if you haven't, this is where you should start: day one (Mon) and days two and three (Tue,Wed). There's no replacement for actually being there, but if you couldn't make it then all talks were recorded and made available online, slides and transcripts included. The second day fully dedicated to WG sessions (Routing, DNS, IPv6, Open Source) was loaded with content and sometimes difficult decisions, as sessions ran in parallel in both rooms. Starting with the Routing WG, the talk titled A Simple BGP generated a bit of discussion, proposing the addition of neighbor roles (customer, provider, peer, internal) to allow for better protection from routing leaks (especially from newcomers). They've forked the BIRD project and published the proof of concept code on github. Randy Bush's presentation on BGP Collector Communities introduced a bad prefix announcement taxonomy, for categorizing the generic leak term based on how it was done (with or without intent, re-originated through IGP redistribution etc.) and a novel way of using the colour pink and Comic Sans in a presentation :). My personal favorite was project Turris, which might very well be my next router if things go well for them (and I hope they do!). In the sea of terrible, broken, featureless and a-complete-waste-of-prime-materials CPEs most that ISPs give you, the CZNIC folk made their own, with security, fast patching and performance in mind. It's a 1Gbps capable router with easy to upgrade firmware, running an OpenWRT base with Debian containers on top for power users. Heaven, right? The only catch is that they built about 1000 for research purposes, but given how popular they turned out to be decided to make a second version they could sell! Go watch the talk, it's got plenty of other interesting details, I won't spoil everything. Lots of stuff in the DNS WG was a bit too much for me, but I learned something interesting: Apple devices handicap the A response by 25ms (if an AAAA response comes in that window then IPv6 is going to be used) and according to Geoff Huston Chrome does the same but by 300ms. Also nobody sends DNS queries over IPv6 as long as IPv4 is there due to problems with transport and big packets. Time to discuss IPv6 performance with Geoff Huston, one of my favorite speakers. The question: is IPv6 faster or slower than IPv4? - the answer? Both. It's slower when using tunneling (which you really really REALLY shouldn't) and just about the same or better when using native unicast. Watch the talk, it's awesome. Next up, two success stories: IPv6 deployment at XS4ALL, I quote: "not very exciting talk, we did it long time ago and kept it running" (what a show-off) and IPv6 deployment experiences from DNA Finland which showed that even bigger ISPs can do it. To wrap up, a BoF (birds of a feather) session was held on the topic of bringing SDN to the IXP. A bit of a shame that not many people who participate in large peering exchanges (read ISPs) were present, as the biggest users are the ones with the most interest. I applaud the efforts of the panel to keep the discussion on the side of "what problems are out there so we can think how to solve them" rather than just theoretically talk about the very theoretical benefits of SDN (some people believe too much in unicorns). It also lead to some very interesting discussions after the session, so all in all it was time well spent! Only one thing is left - the dinner, with tasty food, plenty of drink and good fun. I did not make it to the last session Friday morning, but the closing plenary is definitely worth watching. I had a lot of fun at what was my first proper RIPE meeting. RIPE 72 will take place in Copenhagen, between the 23rd - 27th of May 2016 - looking forward to it!